The management board of fishing ports of central Ha Tinh province released a healthy 22kg sea turtle back to the natural environment this morning. 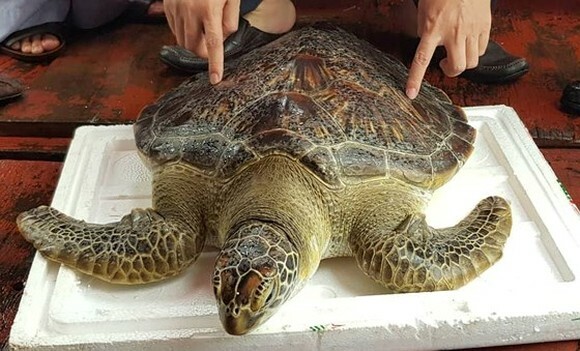 Previously, on July 15, fishermen Tran Minh Hung and Nguyen Van Huong discovered a marine turtle in their net while they were catching sea fishes in Loc Ha beach, about 9-10 nautical miles away from shore. Immediately after bringing the turtles on the ship, the fishermen took it to the shore to hand over to the authorities. According to Bui Tuan Son, Director of the Management Board of fishing ports of Ha Tinh province, from early 2018 to now, this unit has coordinated with the functional forces in the area to receive then to release 3 sea turtles ( all in good health) back to the natural marine environment.